LITTLE ROCK, Ark. 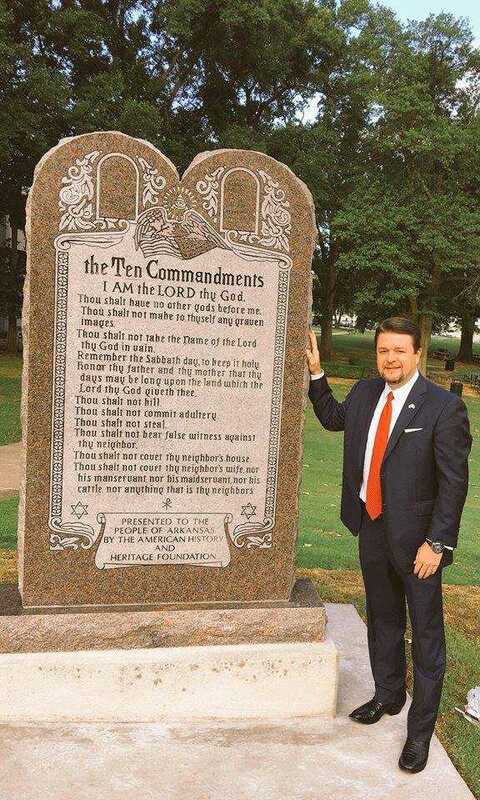 — The Arkansas Capitol Arts and Grounds Commission has approved of design plans in erecting a new Ten Commandments monument outside of the state capitol building after a mentally ill man destroyed the first Decalogue display earlier this year with his car. According to the Associated Press, four concrete posts will be installed as protective barriers around the monument to help prevent a repeat of the June incident. The monument has again been funded with private donations, including the $25,000 donated by the faith-based entertainment company PureFlix. As previously reported, the original monolith had been proposed by Sen. Jason Rapert, R-Bigelow, in 2015. His bill was approved in the House and Senate, and was subsequently signed by Gov. Asa Hutchinson. “The placement of the monument under this section shall not be construed to mean that the State of Arkansas favors any particular religion or denomination over others,” S.B. 939 read in part. Following the monument’s installment in June, Rapert recorded a video explaining why the Decalogue display was both valuable and legal. He noted that the monument was an exact replica of the monument displayed at the Texas state capitol, which was upheld by the U.S. Supreme Court in 2005 in the case of Van Orden v. Perry. Rapert also outlined that the Ten Commandments are part of the architecture at the Supreme Court itself. 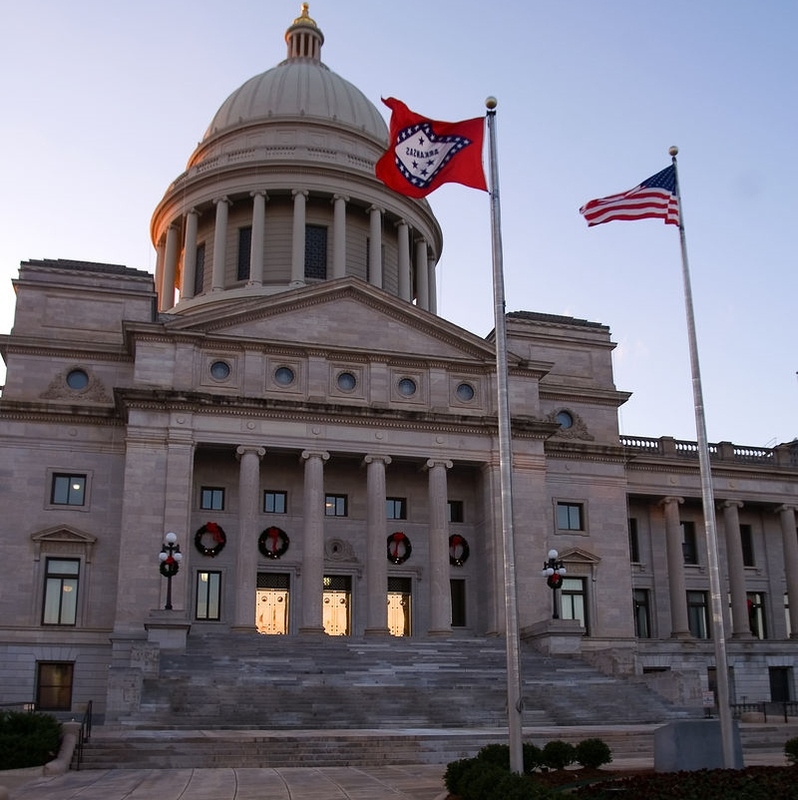 “So, if it’s good enough for the United States capitol, it’s good enough for the state of Arkansas,” Rapert stated. However, less than 24 hours after its installment, a man identified as Michael Tate Reed of Van Buren rammed his car into the Decalogue display, knocking it down. He recorded a video of himself committing the act, which was carried out while it was still dark, at approximately 5 a.m. local time. While Reed characterized himself as a “Pentecostal Jesus freak” on his Facebook page, he said he also believes in the “separation of Church and State.” Reed additionally suffers with mental illness—particularly schizoaffective disorder—and was consequently found to be unfit for trial last month. He was rather ordered to undergo further evaluation in a state hospital. According to Religion News Service, Circuit Judge Chris Piazza has set a hearing for September 2018 to discuss Reed’s mental status. Reed had previously destroyed a Ten Commandments monument in Oklahoma, later explaining that he was obtaining help for his psychiatric issues. “Michael Tate Reed II stated in a letter that his psychotic breaks led to getting inspiration from a Dracula movie, thinking Michael Jackson’s spirit was in meat, believing he was the incarnation of an occult leader and attempting to contact Lucifer’s high priestess he called Gwyneth Paltrow,” Tulsa World outlined. The American History and Heritage Foundation, of which Rapert serves as president, handled the fundraising for both the first and second monument to ensure that no taxpayer funds were used for the display. According to the organization’s GoFundMe page, nearly $82,000 was raised for the monument, which is now complete and ready to be erected. The new monument is expected to be installed within weeks. The Arkansas American Civil Liberties Union (ACLU) has already threatened to sue over its placement.